The closure of Maltby Colliery is a savage blow to what remains of the British Coal Mining industry and the contribution that is made to the security of supply of our Nation’s electricity generation. With up to 50% of our electricity generated from coal we will become reliant on imports with escalating international prices, price increases which will have to be paid through our energy bills. Hargreaves Services acquired Maltby Colliery from UK Coal plc in February 2007. “The colliery has been producing high quality coal for more than 100 years, and is now one of the few remaining deep mines in the UK. Maltby Colliery is also one of the most modern deep pits; it produces more than 1million tonnes of coal per year, with around 500 people employed there. About 60% of Maltby’s total output is supplied under a long-term secure contract with Drax Power Station, Europe’s largest coal-fired power plant. Much of the remaining Maltby production (some 30%) is supplied exclusively to our Monckton coal works near Barnsley. 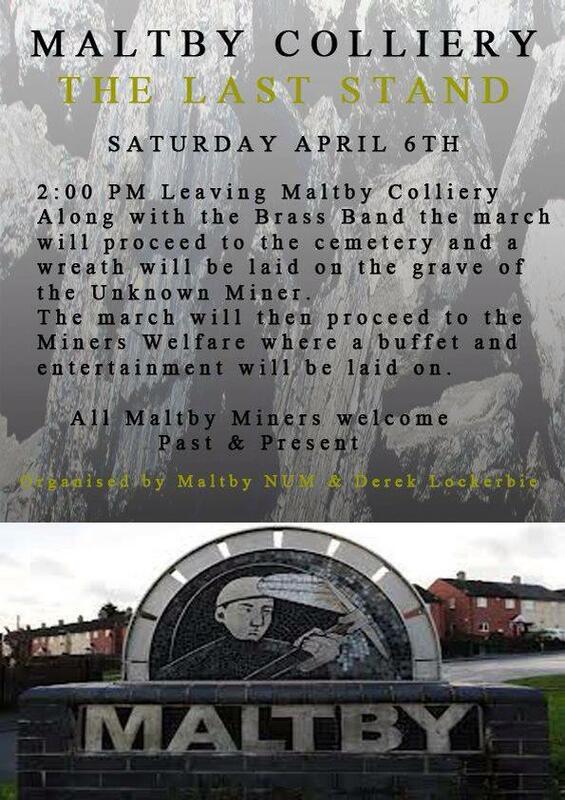 Over 100 years of mining history in Maltby has now come to an end. We celebrate it’s past and look forward to an uncertain future for many of Maltby’s people. This entry was posted in Uncategorized and tagged Hargreaves, Maltby, Maltby Colliery, Maltby History, Remembering Maltby, The Last Stand. Bookmark the permalink. My name is Ted Woolley. I have worked at Maltby Colliery For 45 years. I can confirm that your comment that Amy Rushforth did not march is incorrect as she marched alongside me and my wife up to the Cemetery and on to the Miners institute. Thank you very much Mr Woolley for confirming that Cllr Rushforth was in attendance at the march. It is very important to maltbyblogger – and it’s viewers – that all information published on this blog is absolutely correct.